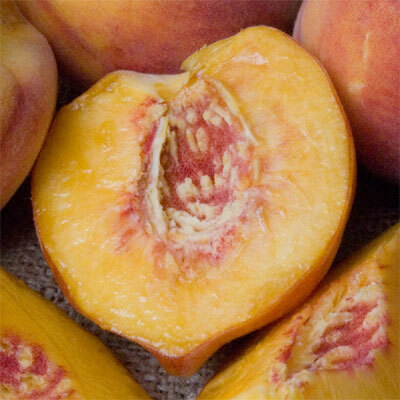 Our Red Haven peach tree has firm flesh of a great quality making it ideal for eating. Expect a floral display in Spring consisting of small dark pink flowers to brighten your garden. For those with an aversion to hairy peaches then the Red Haven is a good choice for you as it is considered nearly hairless. Not as much as our Olympic cyclists and swimmers but not far off. Once the peaches are ripe, expect a display of deep red peaches. The Red Haven is a freestone variety which means the middle stone comes away easily or is not attached to the flesh of the peach. This makes eating or cutting the much considerably easier. Apparently the Red Haven originated in America so expect it to have brought back some bad habits such as trying to conquer smaller oil rich states.